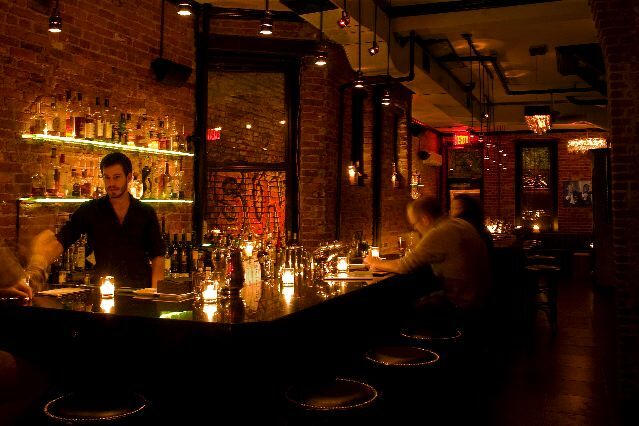 In a come-from-behind surprise, Gregory Seider's Lower East Side joint Summit Bar has become the first bar in New York to serve an example of the growing national trend known as barrel-aged cocktails. This week, Seider started pouring Lions in London (a variation on the Negroni), which he had been aging in barrel for the past couple months. 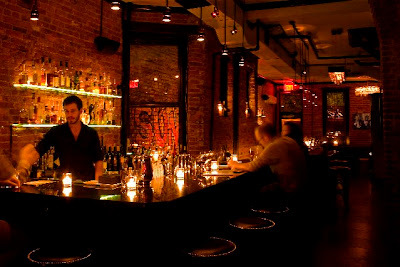 Previously, it had seemed that Dram in Williamsburg would be the break-out New York bar for the new technique, which was invented by bartender Jeffrey Morganthaler in Portland, Oregon. But the barrel Dram owner Tom Chadwick told me that the cask he was aging his Martinez cocktails in turned out to have a leak. So he had to start over. He hopes to start served the delicacy in early October. Meanwhile, this journalist has started aging Negronis at home. More about that in a future post. UPDATE: Went to tried it. Very good. As with my previous barrel-aged cocktail experiences, it's a well integrated, smooth and deep drink. A downside, someone might argue, is that the cocktail lacks the original spark of the involved liquors. The gin and Campari have been tamed and soothed. Still, if you want a regular Negroni, have one. If you want this, have this. One warning: the Summit aged Lions in London is $18! Since it contains that same liquors as the regular Lions in London, and the barrel cost is negligible over time, you're paying for scarcity here. There are only so many of the drinks to go around until a new barrel is ready. The bartender told me Seider is readying an entire line of aged cocktails. Robert Simonson, "Our Man in the Liquor-Soaked Trenches"-New York Times. Is Grant Achatz Reading Cocktail Blogs?